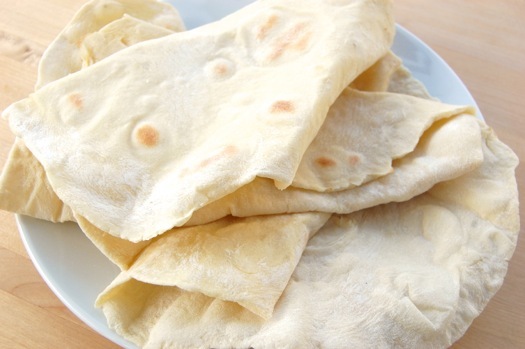 Lavash is a soft, thin flatbread of Armenian origin, popular in the Caucasus, Iran, and Turkey. Traditionally the dough is rolled out flat and slapped against the hot walls of a clay oven. While quite flexible when fresh, lavash dries out quickly and becomes brittle and hard. The soft form is easier to use when making wrap sandwiches; however, the dry form can be used for long-term storage and is used instead of leavened bread in Eucharist traditions by the Armenian Apostolic Church. In villages in Armenia, the dried lavash is stacked high in layers to be used later, and when the time comes to rehydrate the bread, it is sprinkled with water to make it softer again. In its dry form, left-over lavash is used in Iran to make quick meals after being rehydrated with water, butter and cheese. In Armenia the dried bread is broken up into Khash. Fresh lavash is also used with kebabs to make dürüm wraps or in Armenia to make burum which are wraps with herbs and cheese. According to the Encyclopedia International, "Common to all Armenians is their traditional unleavened bread, lav-ash, which is a staple in the Armenian diet." Lavash is the most widespread type of bread in Armenia, Azerbaijan and Iran. In Kashmir it is known as Lavase. It is one of the basic bread products; Kashmiri people consume it on a regular basis for breakfast. As a tradition, Kashmiri Pandits distribute lavase among neighbours, friends and relatives on several occasions, as a symbol of good omen and abundance of food. Lavase pieces with green walnut kernels folded between them are considered a delicacy. This food is also known in English as lahvash or cracker bread.